At the beginning of the year, students have varying levels of familiarity with Newsela. They’ve often read articles assigned by their teacher but haven’t taken time to explore the site on their own. Having students work on Newsela Bingo during the first few days or weeks of the school year is my favorite ways to expose them to the wide variety of articles available on Newsela. 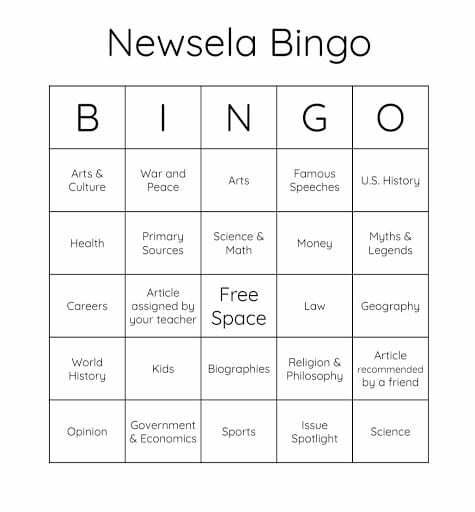 Students will read articles from a range of topics on Newsela by completing a Newsela Bingo game. Newsela bingo can be introduced and completed however it fits best in your classroom. I give each child their own Bingo sheet and tell them they need to get two bingos; only one of which can utilize the free space. As they read self-selected articles and take quizzes they record their scores on their Bingo sheet. If they aren’t happy with a particular score, they’re welcome to choose a different article from the same category and try again. Once they’ve gotten two bingos they add up the cumulative points received on the quizzes and hand in their paper. Click here for a copy of the Newsela Bingo sheet I use with my students. Hi, Lauren! Of COURSE you can post this on the Newsela Resource page! We’d love to share our resources with as many teachers as possible.